Ya’ll bready for this? 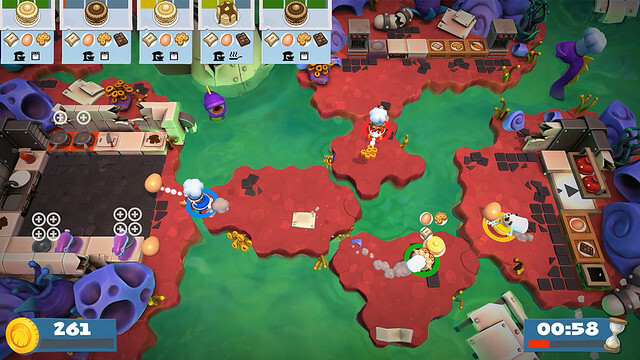 Overcooked 2 is a co-op cooking simulator developed by Ghost Town Games and published by Team17. The players assume the roles of the best chefs that the Onion King could find on such short notice to fight the hungering hordes of the unbread! After a short excursion fighting these fearsome foes by cooking for them, the King declares that his top chefs must travel around the world to train their skills in order to satiate the mass unbread that are on the rise. On the surface, Overcooked 2 seems like a fairly simple cooking game; orders appear on the top right of the screen that you and your partner must work together in order to create and present as culinary masterpieces. Don’t be fooled by this description, Overcooked 2’s mechanics throw a wrench in everything wholesome about the concept. 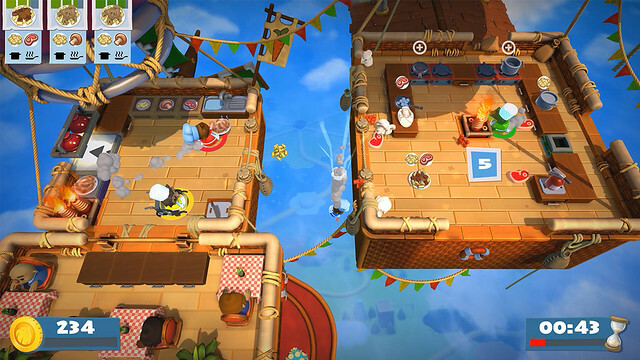 Some levels feature the players floating upon a lofty air balloon, struggling to get all the ingredients in one place to effectively feed whoever is ordering this food from up so high. Other levels place the chefs on separate rafts, constantly changing their placement, making teamwork the key to getting through the levels. 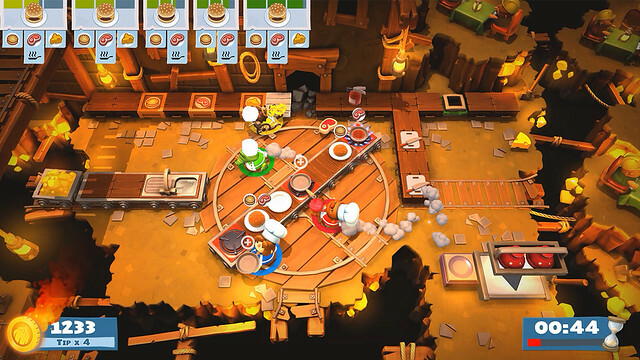 Although the game is entirely playable with a single player, it is much more challenging as the player must switch back and forth between each chef in order to get passed some of the estranged mechanics. Overcooked 2 is best played with a group of people, screaming and hollering at each other to perform different tasks. 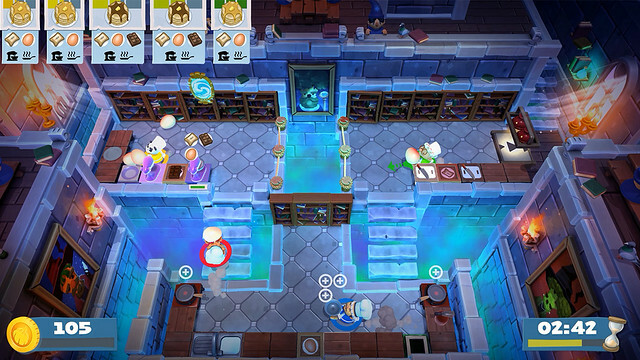 The top down perspective in Overcooked 2 gives the player a complete view of the map they are operating on. Colorful set pieces and spirited scenery set the stage for a culinary adventure, and the cute little player characters are so adorable that it’s difficult to not fall in love with the look of the game, even while throwing everything it has at you. The biggest complaint I have about Overcooked 2 is in the controls. Sometimes when trying to grab an item the character would pick up something completely different if I was too close to another item, or even if I was facing the opposite direction. While this might be an easy glitch to overlook in any other setting, in the heat of the kitchen where every second matters I need to make sure I don’t set a plate on a corner my partner can’t reach or pick up a mushroom because it’s right next to the cheese. The music throughout Overcooked 2 is an amazing blend of genres that fits perfectly with whatever scenario the player is faced with, whether sailing in the skies, crashing down to a sushi bar, or even an enchanted castle. The music sets the whimsical tone of the game in an awesome way, and even displays its chaotic nature when the clock starts to count down to the level ending, speeding up the music just enough to make players panic. Almost every level in Overcooked 2 is unlocked by the stars earned throughout the game. Each level rewards one to three stars depending on how the player performed throughout the level. The more orders you complete the more tips you earn, but let an order sit for too long and you’ll get a pay deduction. Players are encouraged to replay each stage for a perfect score which is truly a feat with this game. Regardless of some of the control issues, Overcooked 2 presented some of the most entertaining moments I’ve had in a couch co-op game. My second player and I would continuously yell and bicker as we try to feed as many people as we could. The chaos and urgency in this game is unmatched and will make just about any player want to stay out of the kitchen for a few days following a playthrough. Regardless of some of the control issues, Overcooked 2 presented some of the most entertaining moments I've had in a couch co-op game. My second player and I would continuously yell and bicker as we try to feed as many people as we could. The chaos and urgency in this game is unmatched and will make just about any player want to stay out of the kitchen for a few days following a playthrough. I like to go fast and play games. Combining the two is just a bonus. Previous ArticleOvercooked 2Next ArticleHEAR YE, HEAR YE! INDIE RTS TITLE CIRCLE EMPIRES RELEASES ONTO THINE PERSONAL COMPUTER THIS VERY DAY!